Unless you’ve had experience of the BIT.TRIP games previously, you’d be forgiven for thinking Runner3 is a platform game; Commander Video and his pink lady friend counterpart both jump, kick and slide their way through obstacle-laden courses. So on the surface it looks that way and through a certain pick up in occasional levels, this certainly becomes an aspect of the game. 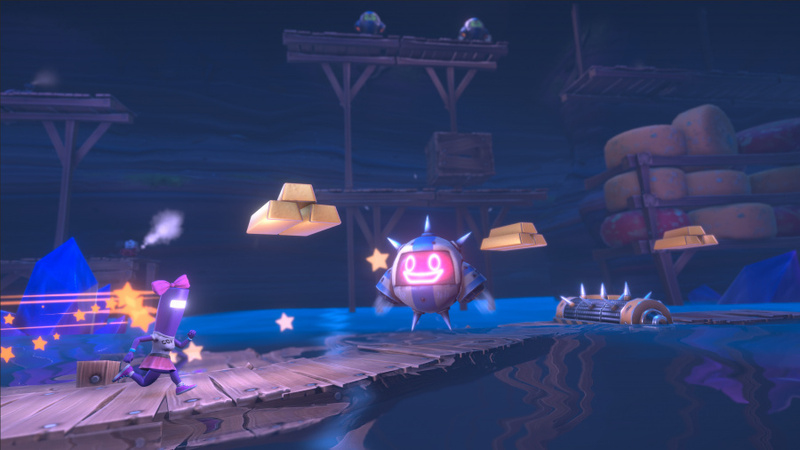 However, BIT.TRIP Runner3 is a rhythm game and it should be treated that way. You can’t choose in which direction to run and aside from a pressing ‘L’ or ‘R’ to choose alternate paths while running, so there’s no freedom in movement. While Commander Video runs on his own, each action, must be timed to an internal metronome or guided by the soundtrack which supplants effects into the arrangement as you collect stacks of gold or slide under an obstacle. 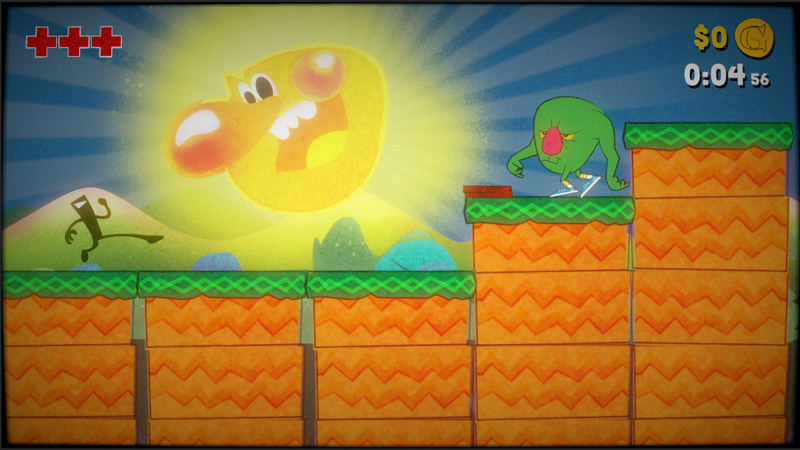 Once you realise that your button presses are, in essence, adding something to the track, the game clicks into place. Think of it as hitting notes in the plastic guitar age of gaming – however, instead of strumming on beats, you’re jumping over an enemy or kicking through a door. Frustratingly, not all actions give a form of feedback be it via vibration or sound, which can cause setbacks in progression and at times, you’ll find yourself wondering if your fingers moved too slowly or if the hit boxes are wonky. When the anger subsides though, you’ll know where you went wrong. You’ll fall into a routine or a pattern. Commander Video will take off from the start line in the first level and signposts let you know how to jump and even when. As the stages progress, more moves are added to your arsenal and it’s not long before you’re sliding underneath blocks or fence posts, kicking obstacles and even double-jumping to achieve more height or distance. There’s a handy checkpoint in the middle of each level which helps when button juggling becomes harder, but if you ignore it you’ll be rewarded. Collecting gold unlocks future levels - which happen to be ultra-hard challenges - and allows personalisation of the protagonist through new skins, accessories and other cosmetic features. Once a level has been cleared a second route opens up for additional playthroughs which allow for gems to be collected, these act as a secondary currency for rarer items. The gem routes also offer a higher level of difficulty, forcing quicker reactions or narrower windows in which to land the right action and taking these routes often lead to other collectibles, one of which is a VHS cassette that unlocks a set of sub-levels called Retro Levels. It’s within these that Runner3 actually does become a platformer. Now you’re given a branch into a new area and within each level is a short platforming based experience that utilises the same actions, but within a new challenge. The idea here, is to collect five coins spread throughout the levels, which further unlock stages ending in a boss fight. These add a little variety to the journey, but are quite clunky compared to the majority of the game. Where the usual levels rely on fluidity of movement and reaction, these Retro levels expand the parameters and require you to use precision of placement using a control scheme that often has a little too much leeway, causing more stumbles and falls than memorable moments. While this may not hinder progression – missing the odd coin is no issue unless your goal is to collect everything in sight – it does make these boss fights more awkward than they need to be. 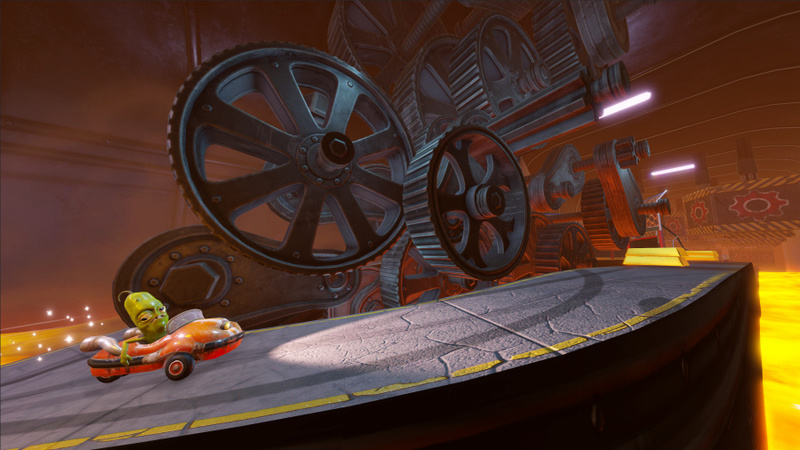 An example of this is seen early on, in the first collection of Retro stages. The boss moves through the levels on rails and at a steady pace, meaning one slip up and you’re caught and it’s back to the start. When the movement lacks the precision needed, it’s easy to feel hampered by the game, rather than your own skill. These diversions are just that; diversions. The crux of the game, which follows a wonderfully surreal and convoluted story narrated by Charles Martinet (the voice of Mario) follows a simple blueprint. If you’re here for the ride, you can forget about some gold and the gems and just reach the end of the game. This will still hold some challenge as later levels are Switch snappingly tough, but if you like some masochistic gameplay, you can set the bar higher and attempt to hit full completion. It must be said, that the game features some great scenery and a collection of enemies that seem to have spilled from the brain of Salvador Dali. Each world has an overriding theme which grows more preposterous as you progress and the developers do a great job of keeping you rewarded for experimenting or exploring – unlocking cameo characters is a huge joy. Runner3 is wonderfully creative and funny, relying on a style of play that belies the challenge at its heart. A few moments of unbalanced control or obstacle design can frustrate, but this will pass when Commander Video finally nails a sequence of movements and makes you feel like a fast-fingered expert. I seriously can’t wait until tomorrow. I’m tracking the shipping on this game like it’s my job. I can’t wait to play as Charles Martinet! No physical release in Europe, correct? I will need to buy this from the USA then. Yep, I reckon I'll be on this day one. I always loved the way they used an auto-runner plus the predictable beat of the music to make the rhythm-action gameplay fall into place. Seems obvious once you've seen it but I'm not aware of anyone doing it before BIT.TRIP. I have high expectations about this game after the superb Runner2, but a lot of the reviews thus far have been pretty mixed... I loved Runner2, but I might wait for a sale with this one. Disappointed in the jagged edges and the ugly textures I'm seeing in let's plays (obv not a realistic game, but the textures look bad a lot, should just made em smooth)....but everything else from the art direction and gameplay and ability to play as Mario's voice as a it's own body has me so fired up for this. so there is a physical release of this? If so I am picking this up tomorrow. @SuperCharlie78 Nah, I want the box. So, should I buy it from the UK eShop for a whisker over £20 or go NA and pay twenty-five bucks? That is the question. Either way, this bad boy is getting bought! This game's hero makes me think of cigarettes. Stoked, come on tomorrow! (Gonna be a pretty dope release week with Atomine preordered and Bloodstained :Curse of The Moon coming too!). Already downloaded it last week. Just waiting for it to be playable. Same goes for Mega Man Legacy Collection 2. I have played both Runner 1 and 2 and completed both, getting this one is a guarantee, the games in this series are my favorite rhythm platforming games. 100% these by skipping the checkpoints never felt stressful because I was happy to play through the entire level again just to hear the music. @The_Pixel_King It's only $12 on the Mexican eShop! Physical version tomorrow, looking forward to it. The best BIT.TRIP games will always be the Wii ones. The campiness of the look was half of what made them great. Really really looking forward to getting this love the Bit.Trip. series , I would love to see sequels to some of the other games in the series and as much as I love the new art style which I do, it looks fantastic it would be amazing to see them revisit the bit style of graphics as well . This and Mega Man in one day. Can't wait. Physical will be here tomorrow, digital is preloaded to play at midnight. Love these games and this studio, so I had no problem double dipping. @gatorboi352 oops looks like someone didn't know this game is multi platform. Problem I got with this game is how they are charging $40 for it on Amazon, and it seems like a rather simple concept for that kind of price. I also heard this game can get really frustratingly difficult. @gortsi no i mean i'm referring to all the switch owners stating "day one purchase err mah gerddd" and whatnot. This game will not sell well on PS and XB. @kobashi100 see my above comment. @JayJ it's a very shallow concept for sure. @Shiryu The pricing for this game is very odd. For some reason it seems to be a lot more expensive in the USA compared to other markets, especially when it comes to the physical version (which is the way I would want to buy this game). Kinda hard to tell if it is worth it. @gatorboi352 I don't find that weird, it's an established series and if they're making a 3rd game it means they must have sold enough before to justify it so some people will get it day 1, as it happens with every game. What's so weird about that? Go to any other site and half the comments about new game announcements are "day 1" and "preordered already". @gortsi who said anything about weird? Switch owners will buy it literally because of the lack of games to buy on switch. I mean who is honestly sitting around going "man, I would totally get game XYZ but ya see, Runner 3 drops that week man. Priorities." Let's be real. @gatorboi352 just to say, I've been extremely excited for this from the day it was announced, before this supposed Switch starvation was even apparent. I don't think it's fair to assume people are only buying this game because they've got nothing else to play just because you don't want to play it. In fact, the only reason I'm NOT saying 'day one purchase err mah gerddd' is because I have too much in my backlog: Mario + Rabbids, Doom, Axiom Verge and Yooka-Laylee. I, personally, feel pretty full. @JayJ From what I have seen Nintendo Dan play on his live stream last week, I very much think it is worth it. @gatorboi352 nah bro that meme is so 2017. You need to get better, I told you you're not on top of your game lately. Haven't played the first two games despite owning them so guess I should start there. I viewed a few clips of Runner 3’s levels. Sure enough, the tunes I heard were ear worms! I’ll check this out soon, if not right away. Bought it from the Mexican eShop for like $13 so it’s already a steal. Can’t wait, hope the preorder goes at midnight. @The_Pixel_King £10.29/ $13.80 on the South African Eshop. @OorWullie hey man- I know you regularly buy from other eshop. Is this an easy thing to do? Also if you do is the game then locked under a different account. Cheers. @The_Pixel_King It's a conundrum. There doesn't seem to be any consistency to it either and it doesn't seem to be just based on the economy of the country or the value of their currency. I buy most of my games from the Norwegian Eshop as for the most part ,it's the cheapest option. Norway is one of the most expensive countries in the world though . I bought Outlast 1 from the Russian Eshop as at £18 it was the cheapest option. Yet Outlast 2,which costs £27 in the UK and similar in Russia,only costs £15 in South Africa,several quick cheaper than the original costs there. Anyway,just bought Runner 3 from there and the download has just finished. I use an app called Revolut to make my purchases ,there are no foreign transaction fees and it gives the real time exchange rate. Sadly it doesn't work on non PAL region Eshops. @darthstuey it's simple. Just change your country of residence on Nintendo account under user profile tab. Then login to eshop and thats it. The game does not lock either. You can change user profile back to UK and play the game. @darthstuey It's very easy once you have it set up. First you need to set up a new Nintendo account with a different email and set the country to the Eshop you wish to use,then on your Switch link this account to your console. I have 6 accounts linked to mine, UK/US/Japan/South Africa/Russia/Norway. Once you have done this you are free to browse their Eshops. Doing this gives you extra icons at the top next to your own profile and it means when opening a game you need to choose which user you want to use,but for the minor inconvenience of an extra button click compared to the money saved,it's something I can put up with. Once a game has been purchased from foreign Eshop,it is available to play from your main user account and will show up as purchased when browsing the UK or any other Eshop. In the unfortunate event your Switch gets lost or damaged ,then to re-download all your purchases ,you'd just need to link all your user accounts to the new console so make a note of each emails you use to open a new Nintendo account. As for purchasing ,any card payment outside your own nation will incur a foreign transaction fee,my bank charges £1.50 for each. To get around this ,I use an app called Revolut which is just brilliant in many ways for me,gaming and non gaming. After an initial set up,which takes minutes , you can top up your Revolut account (minimum £10) and purchase from PAL region Eshops with no foreign transaction fee with real time exchange rates. There are no extra costs to you whatsoever. However much the foreign Eshop price converts to in pounds ,that's what it will cost you. You get a free virtual card to use or you can purchase a physical card for a fiver. A physical card that can then be used around the world ,saving you ATM fees and giving you real exchange rates,unlike banks. As a Brit living in Thailand they are a god send to me,saving me an absolute fortune. @gatorboi352 Quite a few people. The series sells pretty well, for a niche thing. 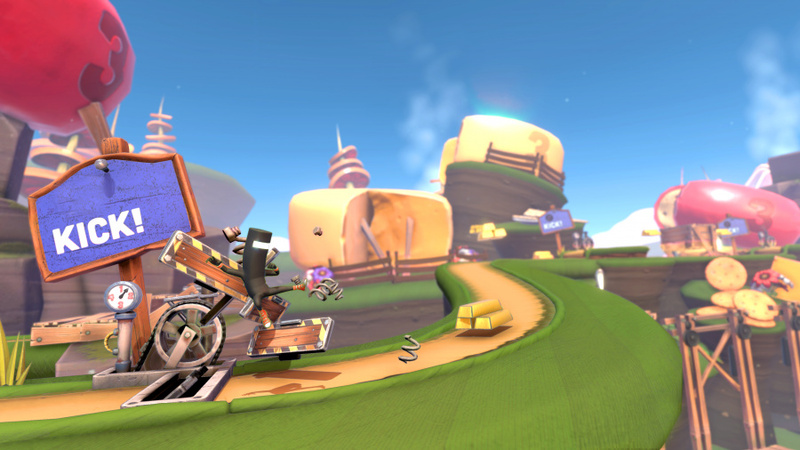 Runner 2 sold over a million copies in its first year. Can't wait to play this. I love these guys. The way they brought these amazing games to WiiWare... it was so brilliant. It really made fall back in love with games. There was that philosophical edge to it, and the perfect gameplay, control... it was such a good time. 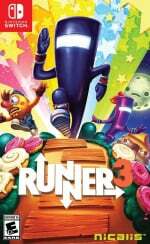 I actually found Runner 2 disappointing, somehow it just wasn't that WiiWare series anymore, where you kept expecting something new every time, every episode.... but this even though again Runner looks really promising . And on Switch. Runner series is amazing. Day one purchase for sure. But it'll have to go into backlog. Still playing DKC Tropical Freeze, barely started Hyrule Warriors, One Piece Pirate Warriors 3, South Park Fractured But Whole, Battle Chasers Nightware, only got one level into Shantae Half Genie Hero, and Mega Man Legacy Collection and Little Nightmares are dropping in half an hour, and Street Fighter Collection, Yoku's Island Express, Ikaruga and Fallen Legion are next week. It's absolutely insane. I'm going to have to start canceling pre-orders because I have too many games coming. It's physically impossible to play them all, even for me. I need to start diverting those resources into bullion and just stick with a few games at a time. Performance in portable mode is not good. Why did developers go with unity?? Levels seem too long, the check point should probably be the length of the level. 1st time I’ve played one of these games and their pretty zany I play 100% handheld the graphics are kinda meh and the load times are a bit long that said the game is enjoyable. is there any chance to buy the box in EU?